To store configurable parameters, .properties file will be used in java. We can Store data in key value pair (key=value). Re compilation not required if we change any keys or values in properties file. Used for internationalization and to store frequently changeable values. java.util.Properties class is sub class of Hashtable. We can read / load the propertied file using InputStream. 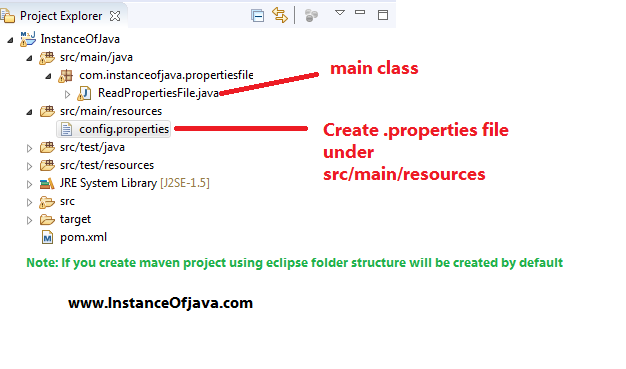 Create a maven project, under resources create one .properties file and load this file in main class using getClass().getClassLoader().getResourceAsStream(properties_FileName). Lets see an example java program on java read properties file from resource folder or how to read values from properties file in java example or how to get values from properties file in java.